Gil was approached to share his ideas about STEM, education and being a Maker with Dr Peter Dalmaris on his Stemiverse podcast. Peter and Gil discussed Gil’s history in the film industry, and we drill into Gil’s previous life in the movie industry in Los Angeles and how his learnings and experiences lead to his re-invention as the “Kosher Tony Stark.” We talk about his experiments with cutting edge technology, prototyping, how he’s using social media and YouTube to expand his reach, and much more. Stemiverse podcast is brought to you by Tech Explorations, a leading provider of educational resources for Makers, STEM students, and teachers. The podcast is a focused discussion about STEM in the educational field. 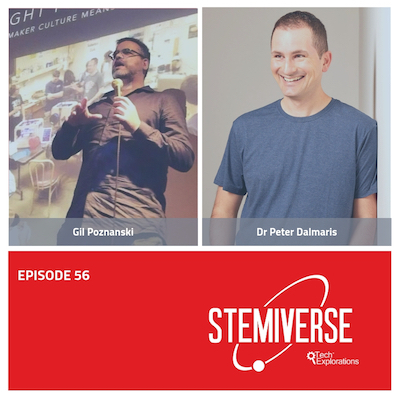 Stemiverse 0056 – Gil Poznanski discusses thinking like a maker, exploring ideas and peer-to-peer learning.